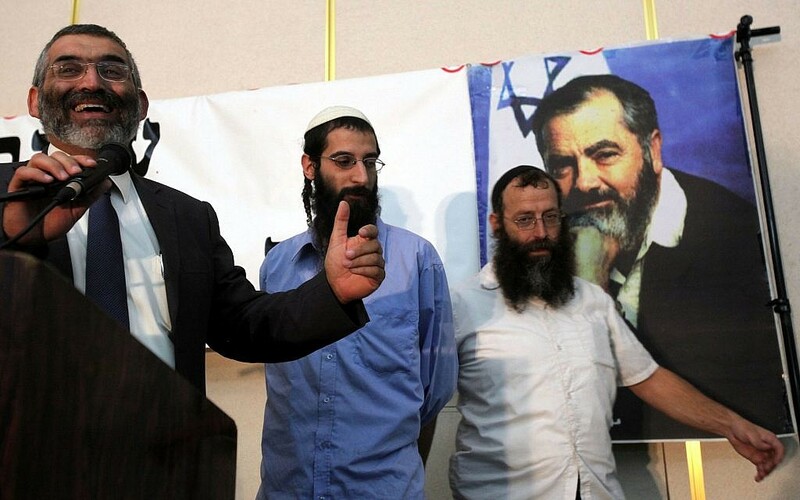 Jewish Home leader Michael Ben Ari (left) speaks during a ceremony honouring the late Jewish extremist leader Meir Kahane. The anti-Palestinianism of Canada’s establishment Jewish organizations is extreme. Fortunately, a growing number of Canadian Jews appear to be rejecting their racism and support for Israeli violence. According to a recent Canadian Jewish News article, the Centre for Israel and Jewish Affairs (CIJA) and United Jewish Appeal Toronto both declined to comment on Prime Minister Benjamin Netanyahu’s alliance with the Jewish Power (Otzma Yehudit) party. For their parts, the American Israel Public Affairs Committee (AIPAC) and American Jewish Committee both criticized Netanyahu’s push to merge Jewish Power and Jewish Home (Bayit Yehudi) to increase the far-right parties’ chance of garnering the minimum 3.25 per cent of the total vote needed to serve in the Knesset. Subsequently, Israel’s Supreme Court banned the leader of Jewish Power, Michael Ben-Ari, from standing in next month’s election. From what I can find, CIJA and UJA Toronto have failed to criticize or distance themselves from Netanyahu’s statement. In fact, they denounce any mention of Israeli apartheid. One wonders how explicit Israeli racism needs to be before CIJA recognizes/criticizes the obvious? More generally, how many Palestinians does Israel need to kill before the established Jewish organizations back away from their staunch support? They’ve endorsed Israeli forces weekly killing of peaceful March of Return protesters in Gaza over the past year. Nearly 200 Palestinians have been killed and another 6,000 injured by live fire in these demonstrations. Not a single Israeli has died. In a particularly disturbing comment on Israel’s supporters, aggression has been good for fundraising. Following the IDF killing of 2,200 Palestinians in Gaza in the summer of 2014, UJA Toronto launched an emergency appeal for Israel, which raised over $5.6 million. Amidst the June 1967 war, leading Canadian capitalist Samuel Bronfman initiated a $25 million campaign for Israel. Similarly, during the October 1973 war Canadians purchased over $100 million in Israel Bonds. After Israel’s summer 2006 destruction of Lebanon another $42 million was raised. While most Canadian Jews, particularly the powerful and moneyed, seem to support Israeli racism and violence two recent polls suggest that a growing proportion of Jewish Canadians don’t. An Independent Jewish Voices and United Jewish People’s Order commissioned EKOS poll found that 37 percent of a random sample of 359 Jewish Canadians surveyed have a negative opinion of the Israeli government, 31 percent oppose the military blockade of Gaza and 30 percent think Palestinians’ call for a boycott of Israel is reasonable. It’s long past time to directly challenge CIJA, the Jewish Federations and the politicians who embolden them. It’s time for those who believe in peace and international justice to treat CIJA and the Federations the same way they treat Palestinians, as enemies to be overcome. When will NDP members push back against the party leadership’s all-too friendly relations with Canada’s leading Israel lobby group? Recently, former NDP Premier of Nova Scotia Darrell Dexter joined the board of the Centre for Israel and Jewish Affairs (CIJA) while four years ago NDP foreign critic Paul Dewar and MP Robert Chisholm attended a CIJA sponsored Young Leadership Israel Advocacy Program retreat. A 2014 calculation found that 20 NDP MPs had been to Israel on a CIJA (or its predecessor) financed tour. Since 2016 now party leader Jagmeet Singh has participated in one of these trips as have Randall Garrison and Murray Rankin, the NDP’s two executives on the Canada Israel Inter-Parliamentary Group, which has hosted lobbying events on Parliament Hill with CIJA. CIJA takes aggressive extreme, anti-Palestinian, positions. CIJA backed moving the US Embassy to Jerusalem, ripping up the Iran nuclear accord and Israeli forces killing over 120 peaceful protesters in Gaza in Spring 2018. At the start of the year CIJA called on its supporters to write the government to request Canada take more Eritrean, Sudanese and other African refugees that Israel is seeking to expel. Apparently, CIJA wants an as ‘Jewish and white as possible’ state in the Middle East, but supports multiculturalism in Canada. CIJA works with and co-sponsors events with the Jewish National Fund, which engages in discriminatory land-use policies outlawed in this country nearly seven decades ago. JNF Canada CEO Lance Davis previously worked as CIJA’s National Jewish Campus Life director and CIJA campaigned aggressively against a 2016 Green Party resolution calling on the Canada Revenue Agency to revoke the charitable status of the JNF, which owns 13% of Israel’s land and systematically discriminates against Palestinian citizens of Israel. In a bid to deter organizations from associating with the Palestinian cause or opposing Israeli belligerence in the region, CIJA demonizes Canadian Arabs and Muslims by constantly accusing them of supporting “terror.” Last September the group said it was “shocked” Ottawa failed to rescind the charitable status of the Islamic Society of British Columbia, which CIJA accused of supporting Hamas, a group Palestinians and most of the world consider a political/resistance organization. If NDP officials are uncomfortable severing ties to the lobbying arm of Canada’s Jewish Federations at minimum they should refuse to participate in CIJA’s parliamentary internship program and lobbying trips to Israel. Pro-Israel politics make for strange bedfellows. B’nai Brith (BB) and the Centre for Israel and Jewish Affairs (CIJA) must be concerned about the furor over Doug Ford’s ties to fringe Toronto mayoral candidate Faith Goldy. Last month the prominent white supremacist participated in a BB support rally and the two pro-Israel groups smeared Dimitri Lascaris when he called on them to publicly reject Goldy. And in a twist highlighting the anti-Palestinianism in mainstream Canadian politics, the media’s favoured critic of Ford’s ties to Goldy, Bernie Farber, championed the CIJA/BB onslaught on Lascaris. Last week Goldy was photographed with Ontario’s new premier at his Ford Fest barbecue. For three days after the photo emerged Ford refused to distance himself from the white nationalist “journalist”. In a bizarre bid to deflect criticism, Ford responded to questions about his support for Goldy by telling the Ontario legislature an NDP MPP supported the Palestinian led Boycott, Divestment and Sanctions (BDS) movement (presumably this was a way of accusing the NDP of anti-Semitism). Goldy is a problem for BB and CIJA. They’d prefer not to criticize someone who is supportive of Israel and popular with their most aggressive anti-Arab/Muslim Israeli nationalist supporters. But, Goldy is toxic to the media and most Jews probably consider her views distasteful. In April, for instance, Goldy promoted a 1937 book by Romanian fascist leader Corneliu Codreanu titled For My Legionaries, which repeatedly attacks Jews and called for eliminating the “Jewish threat”. BB, CIJA and Levitt refused to disassociate themselves from Goldy or the two BB supporters’ who made death threats against politicians. As I detail here and here, CIJA and BB responded to Lascaris highlighting their dalliance with racist extremists by distorting an innocuous tweet about two anti-Palestinian Liberal MPs and then called on politicians to denounce his “anti-Semitism”. Lascaris’ rationale for pressing BB, CIJA and Levitt to disassociate from Goldy was that they aligned with her supporters by attacking those rallying in defence of CUPW. Lascaris should have added Farber to his list of targets. The long-time pro-Israel lobbyist criticized those who rallied in support of CUPW, but remained silent about the aggressive, racist, Goldy supporting counter protest. 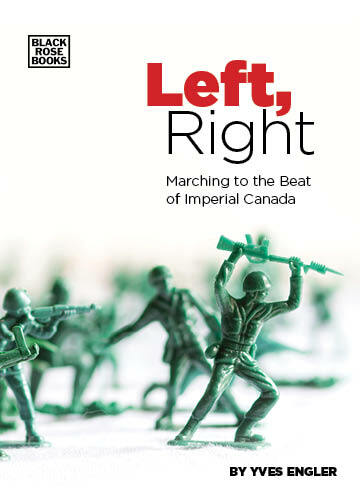 After the display of solidarity with CUPW Farber re-tweeted Levitt’s criticism of the protest at BB’s office. He wrote, “I agree with Michael Levitt. I know a number of elderly Holocaust survivors in this neighbourhood who were taken aback perhaps even traumatized by this protest. It saddens me deeply that dialogue is replaced by perceived intimidation.” The next day he followed up his ‘those levelling smears are the victims’ tweet with a declaration on the “unsettling demonstration in front of B’nai Brith Canada.” In the 400-word statement he ignores the racist, Goldy-supporting Israeli nationalists and repeatedly describes CUPW supporters as “intimidating”. But in reality, it was the counter rally of BB supporters that was threatening. And a self-proclaimed “antiracist” like Farber should have been “unsettled” by the barrage of Islamophobic comments made by BB supporters, not to mention their embrace of Goldy. To this day he appears to have stayed silent about Goldy joining the BB supporters. For two decades Farber was a leader in the anti-Palestinian movement. Since the Canadian Jewish Congress disbanded in 2011 Farber has worked to redress the Islamophobia he stoked while working for that organization, but he continues to take his cues from stridently anti-Palestinian groups. For their part, BB and CIJA failed to criticize Ford’s ties to Goldy. Only after the premier finally distanced himself from the white supremacist mayoral candidate did they tweet about the furor. BB and CIJA are wary of challenging Ford partly because many of their supporters voted for him (a Canadian Jewish News headline noted, “Ontario Tories win big in ridings with large Jewish populations”). Additionally, they support Ford’s anti-Palestinian positions. In one of his first moves after being elected Ford announced that he would seek to ban the annual Al Quds (Jerusalem) Palestinian solidarity event. The Ford-Goldy-BB-CIJA dalliance highlights the growing links between bigoted white nationalist, right-wing politics and Israeli nationalist campaigners. It’s a relationship that anti-racist Palestinian solidarity activists should expose whenever possible. Comments Off on Does Ford Nation include white nationalists, pro-Israel groups? On Thursday lawyer Dimitri Lascaris called on two Liberal MPs to denounce death threats made by B’nai B’rith supporters against a number of other Liberal MPs and the Prime Minister. But instead of condemning those who called for racialized politicians to face the “guillotine” or “stoning”, the Centre for Israel and Jewish Affairs (CIJA) and Canadian politicians smeared the individual drawing attention to the death threats. And on the weekend NDP leaders participated in this unprecedented multi-party smear campaign against one of Canada’s most effective advocates for Palestinian rights. At the behest of CIJA, MP Hélène Laverdière called Lascaris “anti-Semitic” while Jagmeet Singh inferred as much. In this tweet about Housefather and Levitt prioritizing the defence of Israeli crimes above their own party, Lascaris could also have cited the two Liberal MPs’ response to Trudeau questioning whether Israeli forces should have shot Canadian doctor Tarek Loubani in Gaza. The day after Trudeau’s May 16 comment Housefather and Levitt issued a joint statement dissociating themselves from the Prime Minister’s mealy-mouthed criticism of Israeli actions. Conservative Senator Linda Frum described it as “distancing themselves from their own government”, Globe and Mail reporter Robert Fife said they “broke with Mr. Trudeau’s criticism of Israel” and Housefather himself noted in July that he was “disappointed… with the recent statement on Gaza … [so] Levitt and I released our own statement.”The Housefather/Levitt statement claimed “the terrorist organisation Hamas bears direct moral responsibility and culpability” when Israeli troops shoot peaceful protesters, including Canadian doctors. For his part, Levitt chairs the Canada Israel Interparliamentary Group, has by far the most official parliamentary contact with Israel lobby group CIJA, travels regularly to Israel, attends events with the Israeli Ambassador, Consul General, Tel Aviv Mayor, etc., attends “walks with Israel”, says he “stands with Israel”, lobbied Canada to withdraw its logo from the 2016 World Social Forum in Montréal because of criticism of Israel, lobbied to have the Canadian Food Inspection Agency improperly label wines from illegal Israeli settlements, co-founded the Canadian Jewish Public Affairs Committee “to engage Jewish and pro-Israel Canadians”, etc. Since 2016 Lascaris has been repeatedly smeared by Israel lobby groups. In August of that year he led a push within the Green Party to support elements of the boycott, divestment and sanctions movement. A resolution he proposed at their convention sparked a backlash that saw party leader Elizabeth May demand a convention redo to rescind the resolution, which Lascaris successfully defended. Lascaris’ effective activism is a problem for the Israel lobby. So are his credentials.Lascaris was named one of the 25 most influential lawyers by Canadian Lawyer Magazine in 2012 and the next year Canadian Business Magazine dubbed him one of the 50 most influential people in Canadian business, labelling him the “fiercest legal advocate for shareholder rights.” In 2016 he quit a lucrative law career to devote himself to activism and journalism on issues ranging from climate change to Canadian foreign policy. Singh and Laverdière should apologize for participating in CIJA’s scurrilous attack on a leading social justice campaigner. And shame on all the Canadian politicians who have fallen for this sickening smear campaign! How will the election of Doug Ford as premier of Ontario effect the pro-Palestinian movement? Ford’s move isn’t surprising since he’s previously campaigned against Palestinian solidarity activism. During his stint on city council Ford sought to defund Toronto’s Pride Parade because Queers Against Israeli Apartheid was allowed to march alongside hundreds of other groups.”We don’t support hate groups, that’s our view. If they want to march in the parade, then we won’t fund them,” said the councillor. The Centre for Israel and Jewish Affairs, Jewish Defence League and B’nai B’rith immediately applauded or re-tweeted Ford’s call to ban Jerusalem Day protests (as did Canada’s leading Christian Zionist activist and noted opponent of sexual education, Charles McVety, who celebrated Ford’s election by tweeting, “praise God who heard our prayers and delivered victory for the sake of our children.”) During the election campaign B’nai B’rith, JDL and CIJA — to differing degrees — sought to undermine Ford’s main rivals by weaponizing claims of “anti-Semitism” against the NDP. The JDL’s Twitter account repeatedly alleged the NDP was anti-Semitic while B’nai B’rith’s Twitter did the same and its officials participated in a Conservative Party press conference to denounce the NDP’s candidate in Scarborough-Agincourt, Tasleem Riaz, for allegedly posting an Adolf Hitler meme on Facebook five years earlier. More circumspect, CIJA-organized election debates that highlighted NDP candidates’ criticism of Israel and the influential lobby group stayed mum while the Conservatives and right-wing press repeatedly claimed the NDP were anti-Semitic. But it was obvious to anyone familiar with Ford’s history or who followed the election closely that he was the flag bearer for racist sentiment. In the CJN Bernie Farber wrote a piece titled “The depth of Doug Ford’s bigotry,” which highlighted his stereotyping of Jews. For its part, Ricochet ran a story titled “Why Canada’s white supremacists want Doug Ford to win” and Press Progress published stories titled “This White Nationalist Says Doug Ford is Sending Him Anti-Immigrant ‘Dog Whistle’ Messages,” “Pastors Who Preached Homophobic and Anti-Semitic Views Endorse Doug Ford,” “Ontario PC candidate Andrew Lawton: gender and racial discrimination should be legal,” etc. Softer in tone, a number of corporate media outlets published stories making similar points. “Among Doug Ford’s PCs, yet another candidate with bigoted views emerges,” noted a Toronto Star headline. Despite associating with racists and stereotyping Jews, Ford was backed (at least implicitly) by the dominant Israeli nationalist Jewish organizations. He also appears to have won the bulk of Toronto’s sizable Jewish vote. A CJN headline noted, “Ontario Tories win big in ridings with large Jewish populations.” In Thornhill, the riding with the highest concentration of Jews in Ontario, Conservative candidate Gila Martow defeated her nearest rival by an astounding 29,000 to 9,000 votes. Unfortunately a sizable portion of Ontario’s Jewish lobby groups have shifted to the right. This could be due to a decline in real anti-Semitism or ties to an increasingly racist and right-wing Israeli public (in recent days hundreds protested against an Arab family moving into a Jewish neighborhood in Afula, an Israeli pool admitted to maintaining separate swim times for Bedouin and Jews and a Likud member of the Knesset claimed “the whole Jewish race is the greatest human capital, and the smartest”). Whatever the reason, every person, including Jews, who believe in justice for all, must confront this reality. So, how will all this play out for the Palestinian solidarity movement? The election of Doug Ford has already highlighted the Jewish establishment’s preference for a Conservative “populist” over social democrats associated with Palestinian rights. It should also strengthen the link between Israel campaigning and bigoted, right-wing, politics. This will ultimately be a good thing for the Palestinian solidarity movement. Should “Jewish Heritage Month” be used as a cover for Israeli nationalism and to suppress Palestinian protest? A recent incident at a Toronto high school demonstrates the depravity of the pro-Israel lobby. It also illustrates their use of Canadian cultural and “diversity” initiatives to promote a country that declares itself to be the exact opposite of diverse. In another Twitter post, B’nai Brith claimed the Israeli flag flap made a “mockery of Canada’s first Jewish Heritage Month.” Their statement highlights a mindset that views gaining official sanction of cultural initiatives as a way to strengthen their campaign to support a violent, European colonial outpost in the Middle East. Earlier this year the House of Commons unanimously adopted May as “Jewish Heritage Month”. The motion was sponsored by York Centre MP Michael Levitt who is chair of the Canada IsraelInterparliamentary Group and a former board member of the explicitly racist Jewish National Fund. Two weeks ago the Liberal MP issued a statement, partly rebutting the prime minister, that blamed “Hamas incitement” for Israeli forces shooting thousands of peaceful protesters, including Canadian doctor Tarek Loubani. Of course, this would be a laudable goal, but putting up an Israeli flag in a public high school while that country is murdering unarmed Palestinian demonstrators can only cause hatred and division. And it is an affront to thousands of Jewish-Canadians who do not support Israel. The flag flap at Forest Hill Collegiate illustrates how pro-Israel groups have weaponized Jewish cultural initiatives to amplify their anti-Palestinianism. Those who seek justice for Palestinians need to recognize this fact and figure out ways to push back.